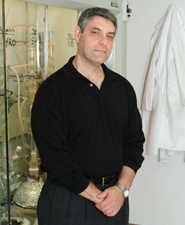 Ted Widlanski received his undergraduate degree from Columbia University. He subsequently received his doctorate from Harvard University in 1989 under the direction of Jeremy Knowles. Dr. Widlanski began his academic career at IU in the summer of 1989. Dr. Widlanski’s research emphasizes an eclectic approach to solving biochemical and biomedical problems using a broad array of chemical approaches. This approach includes the design and evaluation of enzyme inhibitors, the elucidation of enzyme reaction mechanisms, the development of new synthetic methods to access important biologically active compound analogs and biological probes, and the study of components of signal transduction pathways, including those associated with a variety of disease states ranging from cancer to HIV.